Since May of 2011, Riot Games, the developers of League of Legends, have sought to curtail hateful, vitriolic, antagonistic, and deliberately offensive behavior within their community with their Tribunal System. Like all online competitive gaming communities, the immensely popular "MOBA" game has been plagued by trolls, "AFKers", and your average "internet fuckwads". The Tribunal, a peer-adjudication system that allows users to review and punish their fellow players, was groundbreaking. I called it a step towards an "information revolution" and praise it for its use of "public shaming". Now Riot has instituted several changes, adapting once again the way developers and communities police behavior. While the Tribunal system continues to act as the proverbial stick, Riot has added a carrot to their community management repertoire. 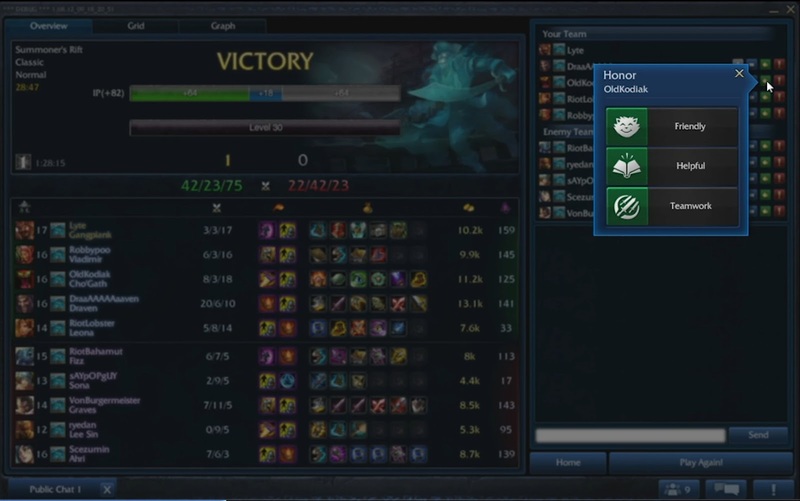 The new Honor system is designed to encourage positive social interactions between players. The Tribunal is considered a success. As of May 25, 2012, more than 47 million votes have been cast. About half of those who have been punished never face the Tribunal again. Still, weeding out the worst players in a gaming community changes the communities behavior, their culture, very slowly. It does little to actually shape behavior for the better. One would hope we would never have to teach players how to be kind to to their peers. Unfortunately, a macho and incredibly offensive set of behavioral norms is already entrenched in games culture as a whole, particularly within competitive games. We have come to the natural evolution of the "teabag". Those wishing to positively shape their community's culture cannot afford to take half measures. Interestingly enough, the Honor system is actually less complex than the Tribunal. After any given match players can distribute honor to both their teammates and their competitors with a simply click of a button. 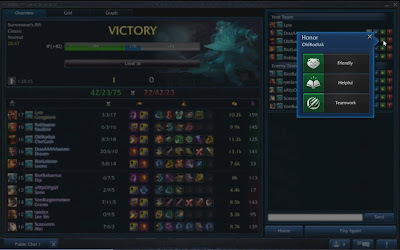 Honor categories include "Helpful", those know willing to share knowledge and tips, "Friendly" to acknowledge those who foster a healthy match environment, "Teamwork" for those players who put in the extra effort to work as a team, and "Honorable Opponent" to those enemies who remain "humble in victory and graceful in defeat". While Honor offers no in-game reward, at least not yet, it does appear along your persistent character, or summoner, profile. All the world can see how well you are appreciated by your fellow players. The Honor system acknowledges the social capital we already maintain. In a persistent environment, including digital ones, how others view your behavior matters. For some its just another number, but the hope is that honorable behavior will become its own reward. If the digital recognition of positive social behavior succeeds here, we may yet see such honor systems repeated elsewhere in online game spaces. It is an experiment a long time coming. Oh, and I should not. Riot has considered "Honor trading" - the intentional distribution of honor between friends to artificially inflate the value. The system accounts for this by calculating total honor to include consistency across a large number of players. For those who violate the rule anyway? They face the stick. utilizing different items, champs, runes, masteries and spells.